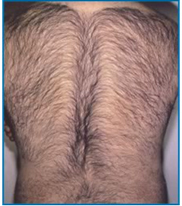 Removing unwanted body hair is of major importance to most women and many men, who invest considerable time, energy, and money in the pursuit of smooth, hairless areas of the body. Q. How does laser hair reduction work ? Each hair follicle goes through a natural growth cycle. This cycle progresses from an active growth phase (anagen) to a transitional phase (catagen) to a resting phase (telogen) and back again. At any one time, a proportion of your hair follicles in each region of your body are in different phases of this cycle. The active growth phase is when the follicle is most sensitive to the effects of laser energy. Laser treatment is less effective at eliminating follicles that are resting or in the transitional phase, which is why more than one treatment may be necessary to achieve the degree of hair reduction you desire. Q. Am I a candidate for laser hair reduction ? In the past, laser technology was much less advanced, and there existed a very real possibility of changing the color of your skin with laser hair reduction, particularly if you have darker skin. With the newest instrumentation, however, this risk has virtually been eliminated. If you have unwanted hair, you are most likely a candidate for laser hair reduction. Many women are self-conscious about unwanted facial and body hair. However, they find that waxing, plucking, bleaching, shaving, and other methods can be time-consuming, painful, and ineffective. Thanks to laser hair removal, our patients can enjoy permanent reduction of unwanted hair after just a few gentle treatments. Men also experience the bother of unwanted hair, and for many men, finding gentle, discrete treatment that lasts can be difficult. Treatment with our state-of-the-art lasers offers men the very best results for hair reduction so that they can enjoy smooth, clear skin. 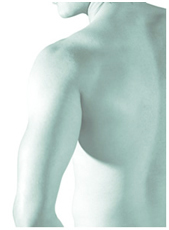 Many of our male patients seek treatment for unwanted hair on the back, legs, and chest, but we are able to perform laser hair reduction on all areas of the body and on all skin types. Q. How do I prepare for laser hair reduction ? Laser energy targets the pigment in the hair and the hair follicle. Therefore, you should not bleach or pluck your hairs for one month prior to your treatment. If you regularly shave the area, stop shaving one day prior to your treatment. Also, avoid direct sun exposure to the area for two weeks prior to your treatment, as treatments should not be performed on sunburned or deeply tanned skin. On the day of your appointment, do not apply any cosmetics, perfume, moisturizers, sunscreens or deodorants to the area(s) to be treated. These must be removed prior to your treatment, because they may prevent even penetration of the laser energy through the skin. Q. What can I expect during the treatment ? Because the laser produces an intense burst of light, you and doctor and his staff will wear protective eyewear during the procedure. During the treatment, doctor passes a small hand piece over the skin that fires repeated bursts of laser energy. These have been described as feeling like a snapping rubber band that lasts for a fraction of a second. After this sensation has passed, there is no further discomfort associated with the procedure. Q. How many treatments will be required to achieve complete hair reduction ? Since only the active growth phase follicles are eliminated during each treatment, you may require more than one treatment to be satisfied with the degree of hair reduction in any one area. Most patients undergo three to four treatments at monthly intervals followed by a maintenance touchup six months later. After that treatment, you may never again require another treatment. Q. What can I expect after the treatment ? The treated site may appear pink and slightly swollen following the treatment, resembling a mild sunburn. This appearance should subside within one hour of the treatment. It is safe to apply sunscreen, moisturizer or makeup following the procedure, and you may resume your normal daily activities immediately. Following your treatment, you should avoid sun tanning beds or direct sun exposure to the treated area for two to three days, because the area is initially more sensitive to harmful ultraviolet rays. Most patients experience 60 to 90 percent hair reduction in the treated areas. 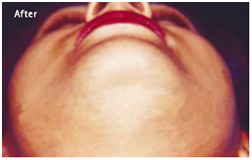 No laser hair reduction system available today can disable 100 percent of hairs treated, and results vary depending on a patient's hair and skin characteristics. Risks include the chance of burning the skin or discoloring dark skin with the laser, hypopigmentation (white spots), flare of acne, swelling around the follicle, scab forming, and purpura. In some countries, laser hair removal has not yet been approved for use due to uncertainty about potential side effects. 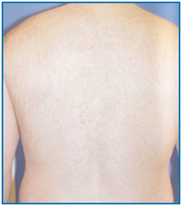 Some consumers have experienced long-lasting hair removal or permanent hair reduction. Considered safe if performed properly. Useful for large areas such as backs or legs. Regrowth can come back lighter in color or finer in texture. Light-skinned consumers with dark hair have the best results. Long-term data on safety and effectiveness have not been accurately established. Response rates have not been established. Regrowth rates have not been accurately established and cannot be predicted due to numerous variables. Generally not as effective on unpigmented (gray) hairs and red or blonde hair. Must be used very cautiously (if at all) on darker skin tones or on consumers who tan themselves. Improper treatment can cause burns, lesions, skin discoloration lasting several months, or patchy/patterned regrowth. Recent data suggest other skin structures are often affected by laser irradiation, and long term effects of this constitute an unknown risk. Regulation varies by state, so inadequate controls exist to ensure competent practitioners. Some consumers, even ideal candidates, do not respond to treatment. Q. Why are treatments performed at monthly intervals ? Repeated treatments are meant to treat the follicles that were not actively growing during a previous treatment. By spacing treatments out by four to five weeks, this allows the time necessary for resting phase or transitional phase follicles to re-enter the active growth phase and become sensitive to the effects of the laser energy. Q. Is there a limit to the number of treatments or the number of areas I have treated ? No. Laser hair reduction is safer than ever before. Using state of the art technology, laser hair reduction has become a relatively minor procedure with essentially no down time. There is no limit to the number of areas or the number of treatments you may undergo.